Paul Shelor completed his BA degree in music at Clarke College (Dubuque , IA), in 1989. In 1992 he received a Masters of Music degree in choral conducting from the University of Missouri Conservatory of Music (Kansas City), where he studied under the renowned choral conductor and teacher Dr. Eph Ehly. Since 1992, Mr. Shelor has taught general music and directed choirs at Quincy Junior High School, adding choral groups at Quincy Senior High School to his teaching duties in 2004. As a vocalist, Shelor has performed numerous supporting roles with Quincy ’s Muddy River Opera Company. He has sung major solo parts with the Quincy Symphony Orchestra and Chorus, including the role of Elijah in Mendelssohn’s Elijah in 2000, and the bass solos in the 1997 and 2002 performances of Handel’s Messiah. 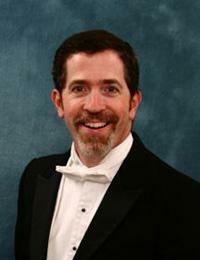 In April 2012 Mr. Shelor was the baritone soloist for the Quincy Symphony’s performance of John Rutter’s Mass of the Children. Shelor also serves as guest conductor for Quincy ’s Piano Ensemble Festival and is choir master for the Muddy River Opera Company. First conducting the QAYC’s Kinderchor in 1995, Shelor became the conductor of the Concert Choir in 2000. In the summer of 2009, Shelor took singers from both groups to England, where they concertized and had a workshop experience with the English choral conductor Jonathan Wilcocks. Paul and wife Mary, piano teacher and busy accompanist, live in Quincy with their two sons, Christopher and Bryson.